Fixed a bug whereby Syanna would not repeat Aglais's Deploy ability. Fixed a bug whereby the special card Spawned from Aguara: True Form would not trigger Assimilate. Fixed a bug whereby Land of a Thousand Fables could be played on the opponent's side of the board. Fixed a bug whereby Raging Bear would not damage self when played adjacent to Tactical Advantage. Fixed a bug whereby Regis: Bloodlust could not target allied units. Fixed a bug whereby Roderick of Dun Tynne would shuffle the unplayed card into the deck. Fixed a bug whereby Samum would move only one unit to the other row. Fixed a bug whereby Traveling Merchant would draw a card if he was the last card played from hand. Fixed a bug whereby Usurper would disable the opponent's Leader ability at the start of each round. Fixed a bug whereby Weeping Willow would gain Bleeding if it was already damaged when played. Fixed the boost VFX for Cintrian Envoy's Formation ability. Menno Coehoorn's provision cost changed from 10 to 9. Nice, I got one more point to invest in my NG improbable deck! 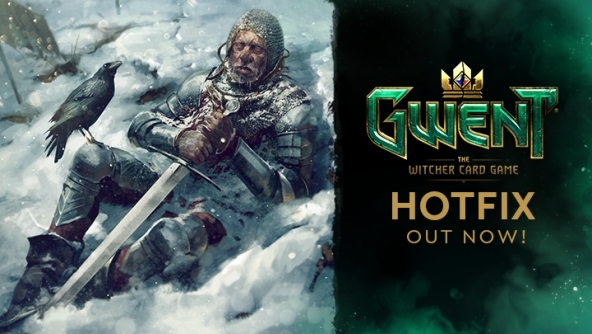 Hi Gwent Team. I have a question for you?, You know the leader board on gwent on console, there is a heading on the bottom of the leader board saying reach level 25 to see your score, I am well above and still cant see it, will this be fixed?. will add photo later. There is also an issue with botchling/rubberkin. It doesn't trigger its effect when I seize with Ardal and flip it. Fix the blurry premiums please. Encountered a bug with Nekurat getting stuck at "0" in the cooldown, and not working. Another small thing - it would be helpful if Bruxa could get a thrive icon when its deathblow requirement is met. Usurper locks my leader ability for the whole match anyway. Did I miss something? It's a fix for Damien, which allows you to replay your leader, even when it was locked by Usurper. There's still a bug with samum, you choose a unit to damage by 3 and it doesn't do anything, just disappears from your hand. Also, barnabas sometimes boosts only 1 or 2 units, even though you have all 3 of them on board, elf, dwarf and dryad. Hey can someone help ? My game didnt update, sooo i dont have the hotfix ? It shoud update right ? Im on ps4..
Or this hotfix is on servers only ? It is a server side HotFix. So, no game updates.